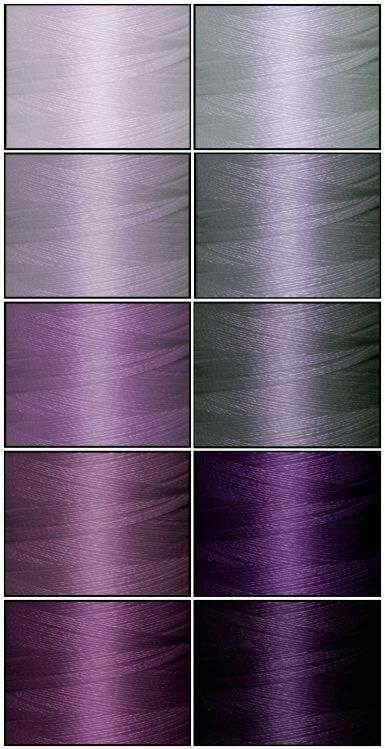 This embroidery thread kit includes 10 gradient colors from ThreaDelight ™ 260 color palette. Many designs, especially floral and abstract ones, look amazing when embroidered using a single color family. And these are exactly the patterns most suitable for clothes, linens and fashion accessories. It's difficult to over evaluate the importance of having gradient colors in your stash. It's weight is 40 wt. The quality is awesome. It looks a bit thicker than other 40wt thread brands we've tried, and this bit of extra volume seems to have very good impact on embroideries. The designs come out dimensional and beautiful. This difference is especially noticeable on towels. Each cone has a small plastic leg. They are steady, leg diameter is 1.6 inches, cone height is 2.7 inches. Because of the proper leg shape and size, the thread unwinds and feeds up properly. You may purchase this 10 cones kit separately, or get it inside a large 260 colors kit. The 260 colors kit is a great buy, because it includes a huge built in quantitydiscount. So if you need quite a few colors - consider getting the entire ThreaDelight ™ palette kit. The price per cone is the best this way. 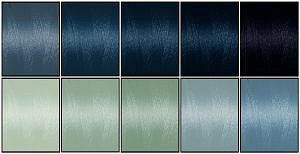 You may download a color chart in PDF format for this specific thread kit here. This downloadable chart includes large color swatches of all colors featured in current kit, and conversions to ThreaDelight ™ palette from a few other brands. For your convenience, the colors in PDF chart are sorted from light to dark within each color family, like on the photo below. So color matching is more than easy.